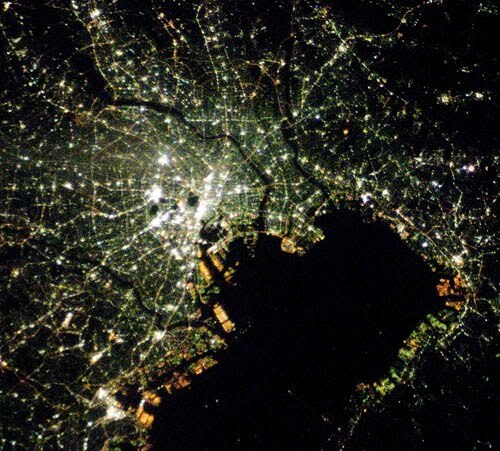 [Image: Tokyo at night, courtesy of NASA's Earth Observatory]. At the height of the Cold War, the sprawling, decentralized suburban landscape of the United States was seen by many military planners as a form of spatial self-defense. As historian David Krugler explains in This Is Only a Test: How Washington D.C. Prepared for Nuclear War, "urban dispersal" was viewed as a defensive military tactic, one that would greatly increase the nation's chance of survival in the event of nuclear attack. Specially formatted residential landscapes such as "cluster cities" were thus proposed, "each with a maximum population of 50,000." These smaller satellite cities would not only reshape the civilian landscape of the United States, they would make its citizens, its industrial base, and its infrastructure much harder to target. "This might seem the stuff of Cold War science fiction," Krugler writes, "but after World War II, many urban and civil defense planners believed cluster cities, also called dispersal, should be the future of the American metropolis." Krugler points out that this suburban dispersal was not always advised in the name of military strategy: "Many urban planners believed dispersal could spur slum clearance, diminish industrial pollution, and produce parks. Not only would dispersal shield America's cities, it would save them from problems of their own making." Earlier this week, Japanese prime minister Naoto Kan was advised "to decentralize Japan" out of fear of "Tokyo annihilation danger." Indeed, we read, the recent 9.0 earthquake, tsunami, and partial nuclear meltdown at Fukushima together suggest that "the nation must reduce the role of its capital city to avert an even greater catastrophe." Takayoshi Igarashi, a professor at Hosei University, explains: "I told the prime minister that nationwide dispersal is the first thing we need to do as we rebuild. We have no idea when the big one’s going to hit Tokyo, but when it does, it’s going to annihilate the entire country because everything is here." His conclusion: "The lesson we need to take away from this disaster is that we have to restructure Japan as an entire nation"—a seismic decentralization that relies as much on horizontal geography as on vertical building code. This could thus be "the nation’s biggest investment in urban planning in decades." Tokyo is Japan's New York, LA and Washington in one: commerce, culture, entertainment and politics. It is true that a major earthquake would set Japan very far back, if not deal the death blow to its 'first world' status. On the other hand, how many successful non-organic cities are there? How do you force any of the private sector to move? There have been far-fetched plans to move the government, or duplicate its offices, to Nagano. In the, unlikely, event that Japan pursues decentralization, the only thing to move is the government. The other historical capital is Kyoto. To move the government to the Kyoto/Osaka area would at least mean that either the public, or the private sector, would take a bad hit: but not both. It would also boost the smaller Kansai (Osaka area) economy far more than it would hurt the larger Kanto (Tokyo area) one. This brings to mind Frank Lloyd Wright's Broadacre City concept. Urban decentralization appears very likely over the long run because there are both "push" and "pull" factors, and also a long-term technological trend. "Push" factors are the desires of States to "not keep all their eggs in one basket" in the event of the use of WMD or natural disasters: they lead to things such as the US interstate highway system which make it easier to live away from the city proper. "Pull" factors are the desire of people for lots of space in which to live and their dislike of crowding even in public places. Working together, they will spread people out as far as technologically-possible. The reason why these factors have resulted in wider and wider urban zones over the last 250 years is that the "technologically-possible" has expanded. The inventions of the stagecoach, omnibus, steam railroad, electric railroad and motorbus have extended the range between residence and workplace: people now routinely live 10-60 miles from their jobs. This is "an hour's commute," and it has been a fairly steady limitation throughout history. It's just that an hour's commute means a couple of miles if one must go on foot, but can mean tens of miles if one travels by road or rail. This leads to the creation of suburbs far from the primary city (there have always been "suburbs," but they used to nestle right outside the city walls). The 21st century will probably see both faster road and rail service, and the development and extension to the middle classes of personal air transportation. When commuters can travel at speeds of hundreds of miles an hour, they will be able to live hundreds of miles from their wokplaces, and so the exurbs will boom as the suburbs did in the 19th and 20th centuries. Another factor which will have increasing impact is telecommuting. As telepresence drops in cost and improves in quality, larger and larger numbers of people will work from home offices or studies, making only occasional trips to their place of physical employment. This could potentially spread out the zone of residence from a city to include a whole planet and low to medium orbit. The WMD factor is still significant: we tend to underrate it now because the Cold War never went hot, but it will take only one or two cities going up in mushroom clouds to remind us that one of the implications of E=MC squared is that one shouldn't put too many valuable people and things too close together, because that's just tempting fate. And fission-fusion-fission bombs are not, of course, the theoretically ultimate in destruction. Another lense to put this through is that Tokyo and many other Japanese cities are the agglomeration of dozens of small cities and villages, which often remain in name only as metro stops. Tokyo, like London and the soon-to-be megalopolis Guangzhou is extremely dispersed, but also extremely dense. Each village consumed by the larger city could retain it's governmental identity and inherit a portion of the larger city's civic emergency functions in a catastrophe. Am I the only one here who is terrified of this idea? How quickly it would eat up and destroy their finite land and historic identity/charm that lies both outside and in the technologically prolific center of Tokyo. As Mr S. said, moving the government to somewhere else like Kyoto would be a much better idea I think, and much less intensive! I agree with Cedric. the idea that all people desire lots of space is a projection--there's nothing wrong with high-density living if it's managed well. The decentralization of American cities is an ongoing tragedy that's permanently altered the nation's environmental outlook and character. Our suburbs and exurbs are bland, spiritless places, by and large, and as for slum clearance... yes, that is what people believed mid-century, and what many still believe, but the reality is that the destruction of the urban middle class in cities like Detroit and Cleveland helped spur the decay of those cities, while the projects that arose in place of destroyed, organic neighborhoods in Chicago and the Bronx created depressing, unsafe living environments for the people who had to live there. Moving people further out is not an answer--altering the way we prepare for disaster based on researching what failed this time is what we need to do. It does not require that "all people desire lots of space" for cities to sprawl out more widely given longer-ranged commuter transportation -- I'm not talking here about a Clifford D. Simak "Huddling Places" scenario where the city cores are completely abandoned. It simply requires that some people desire more space, and the longer-ranged transport technology to exist for the cities to sprawl. You're assuming that the decision as to the distance to reside from one's job is a collective social decision: it's not, it's a decision made at least semi-independently by each person when he seeks a home and a job, and factors in the commute time and difficulty. In order to prevent this sprawl it would be necessary to in some way forcibly limit the commute distance to a certain maximum, independent of technology. Note that, historically, cities all over the world have sprawled more widely as cheaper and longer-ranged commuter transportation became available. This is not purely an American tendency, it can be seen everywhere save in areas where the physical terrain (oceans, lakes, mountain ranges etc.) prevent such sprawl. As wider ownership of air vehicles and wider construction of long bridges and causeways leaps such obstacles, such obstacles become increasingly less relevant. Good examples of this sprawl in a fairly mature form for the groundcar era are visible not only in America but also in Canada, Britain, Australia and Europe, and Chinese cities are in the process of sprawling as groundcar ownership and bus services widen. This sprawl has historically been destructive of the ecology but it does not have to be in the future. Especially as largely-underground or elevated- high-speed rail tubes and aircars displace surface trains and groundcars, the spaces between the exurban towns and the central cities can be allowed to become parkland or even revert to wilderness. As less-polluting energy (nuclear, solar) and goods production (fabricator, nanotech vat) technologies displace fossil fuels and open factories, these wilderness zones can become healthy homes for a diverse wildlife. The issue is not "moving people further out," it is that people want to move "further out," provided that they can enjoy equal or lesser commute times. Denying the reality that most people prefer to live in smaller and less-dense communities, at least once they decide to have families, does not change matters: it only creates a situation of dissatisfied urban and suburban families, and greater crowding for the people who actually want to live near or in the urban cores. The difference, Jordan, is that this type of sprawl is deliberate, concise, and pre-meditated by some planner, or more likely, governmental position. This is where the danger lies. Cities grow, and often outward as much as upward, but the organic growth is of a different kind - although, not inherently less destructive. On a last note, I think we should abstain from pretending we know, holistically, where people want to live. The fact is, different people, at different stages of their lives will prefer a different spot somewhere within the urban/rural transect. But for the zone in question, the suburbs, or exurbs, are obviously failing at many things. They are being fled from in cities like Detroit, St. Luis, and I won't go on... But the ratio of land allotted to suburban living, compared to that of urban or rural land needs to decline drastically! I'm very vehement about this, to the point that I've occasionally fantasized about a world with nothing other than urban life for living, rural life for growing, and natural land for preserving. That is, of course, the extreme.